Recently, the lovely and insightful blogger adordee wrote a post on How to Beauty Haul Responsibly, which was an excellent and thought-provoking read. This is a topic near and dear to my heart, because while I am a rapid and joyful consumer of skincare, I'm also fanatical about organization and planning, comparing costs, and hunting down deals. I've developed a system and approach that lets me balance how much product my skin can realistically use vs my thirst for new products, and all without negatively impacting our finances. However, I think sometimes this cognizant and deliberate approach is easily overlooked when people are eyeballing sparkling hoards of hauls and sprawling towers of product. I know this is a party pooper topic that no-one really wants to talk about, but it really is important. I know from experience how easy it is to get yourself swept away. It’s so easy to reach for your wallet to spend spend spend when you see rave reviews, first looks, unboxings and the like from bloggers or users just gushing about their new Holy Grails. I agree with her, and I also agree that this topic needs to be discussed more in the blogging community, even if only to give context to our individual decision making process that we use to avoid a tailspin of overspending and impulse buying. Speaking of deliberate buying, I'll also be unboxing my recent Jolse haul as an example of my decision making process in action. Details of my Jolse Haul & why 'Bae'? I've just finished a week (and weekend) long project, so this post was completed in sections. If you spy something that you could swear wasn't there before, it's not you, I promise. As strange as it may sound, skincare is most definitely a hobby for me and it's something I actively enjoy and indulge myself in for a few hours every day. That is not restricted to applying skincare, mind you, although I do have a pretty serious lineup of products available for use. It includes: reading blogs, browsing new additions to seller sites, participating in online community discussions, socializing with other Asian beauty product fans, chatting with fellow bloggers, researching ingredients, interacting on social media, replying to comments, messages, and emails, comparison shopping, updating my spreadsheet, building 'someday' wishlists, even learning Korean! While that is likely overkill for most, the extraneous elements outside of "buy product, receive product, apply product, repeat" are both relaxing and energizing for me, and my entire hobby costs me approximately the equivalent of a movie date or a frugal dinner out once a week. For something that provides me literally hours of entertainment every day and never stagnates, that's a pretty sweet cost:benefit ratio. That being said, I am fully aware that skincare is an unfussy and basic necessity for many people, rather than "skincaretainement"- a concept fanserviced-b recently discussed on her Instagram, and then wrote a full blog post- and that the time and cost involved is burdensome instead of a source of entertainment. For some, though, it transcends the hours one can easily lose in a happy tumble down the rabbit hole and becomes a benefit to their mental health, as discussed in this touching and honest post on How My Elaborate Korean Skincare Routine Helps Me Fight Depression, written by blogger 50 Shades of Snail. which I am trying to resist buying in full size; but in the immortal words of cheesy 90's pop: "Ooh I want you, I don't know if I need you but, ooh I'd die to find out." Sometimes buying expensive things in samples is a brilliant idea, sometimes not. So how do you indulge your hobby without murdering your wallet? That's really going to depend on your personal situation and what works for you, but here's how I keep my hobby and my spending balanced. And by 'balanced' I mean "heavy on the former, minimal on the latter." As I mentioned, behind every Haul is hours upon hours of research, discussion, organization, planning, and deliberate decision making. The exact process will depend on the person, but I urge everyone to be contentious about their purchases and be comfortable with why they are buying that product. If that reason is simply because you get pleasure out of collecting cute and/or pretty things that have a secondary cosmetic purpose, you can afford it without causing financial impact to yourself or others, and you are happy with your purchase, there is no reason to feel ashamed about it. But by the same token, if you do feel conflicted about your purchases after the post-purchase glow has worn off, it's time for some self-reflection to root out why and what changes can be made. There is nothing wrong with taking care of yourself. Let me say that again. There is nothing wrong with taking care of yourself. You are worth it. But if your purchases start to trigger feelings of being out of control, following trends and products out of excitement rather than their value to you and your needs, buying more than you can use or afford, it's OK to hop off the hype train and take stock of what you really need. I track all purchases in a spreadsheet to stay on top of how much I'm actually spending, & I also have a testing schedule. Is it a duplicate of something I already have/want? What skincare goal will it assist? Does it suit my skin type? What reviews are out there about it? When will a place in my schedule be available to test it? Figure out a system that works for you. Maybe it's a monthly budget, maybe it's "one new product per emptied product" replacement system, maybe it's a spreadsheet that tracks all your purchases, maybe it's a wishlist that you 'sit on' for a few weeks (or month) before purchasing, maybe it's a master project of comparison shopping, maybe it's looking at your current skincare collection and only buying what's 'missing', maybe it's only buying what you can use within 3-6 months. Maybe it's as simple as just having a heart-to-skin-to-heart talk with yourself about what your skin does and doesn't need, and sticking with that. In my case, I use my spreadsheet to track my stash and my testing schedule. Between these two, it keeps me honest in terms of what I can realistically use; my stash tracks how many of each type of product I have (how many creams does one really need? Answer: not many!) and when I received it. There's no sense in me buying products that are duplicate steps for things I already have waiting to be tested and used. 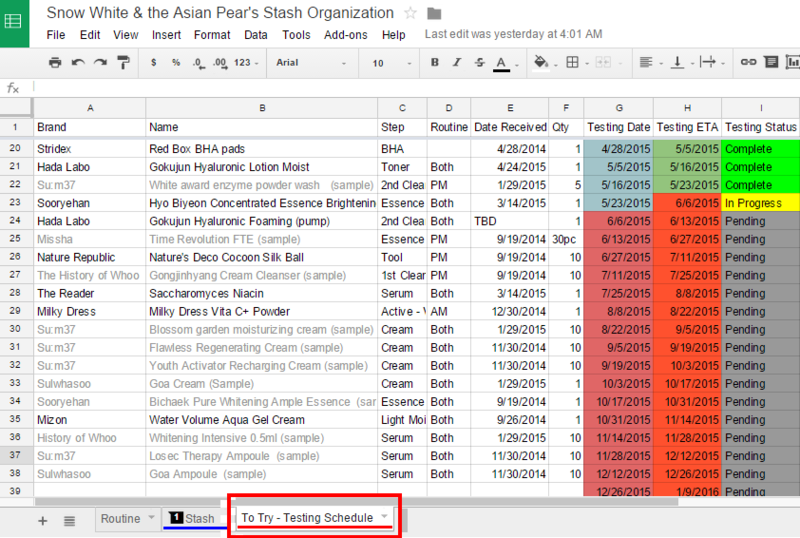 To see my current testing schedule, take a look at my live spreadsheet here. That's the second element for me; my testing schedule. Right now, I have my testing schedule mapped out for the rest of the year, but I have only 5 full-size products in that 'to be tested' list, including one I have not even received yet. The rest are samples that I am interested in trying, but if something comes up that I am dying to swap in instead, I don't feel at all guilting for 'bumping' a sample out of the queue. Now, whenever I am ogling someone's rave review or gorgeous purchases and feel the temptation to snag one myself, I take a look at my testing schedule and decide if I am willing to bump something out to make way for the product, and the answer is usually no. empty by the time this was taken. When I finally do decide to make a haul purchase, I will have spent weeks, if not months, curating it. Such was the case with my Jolse Mother's Day Sale haul. Before I get into the details of what I bought, how much it was, and my savings, I'd like to take a moment to comment on the power of customer service and social media. I had never purchased from Jolse before, as I prefer sites that allow me to control the shipping cost and Jolse builds their cost into the list price and thus offers free shipping. I always comparison shop, and Jolse + free shipping was usually in line with other sellers + shipping, but since I tend to wait and get large orders spaced far apart, I never ended up making an order there. Jolse wants to be your Bae, too. "Jolse wants to be your Bae always as long as you want... ♥"
"We print the format and attach on every packages so you will see same one on your package when you receive it. Jolse accepted you and we accept all girls if they want! (Do I talk too flirting like a player? hehe)"
Hilarious! Provided that there are no issues with my purchase, their personable approach will have me returning as a customer. I had a Jolse cart ready with some routine staples (you can see my product lineup here: Multi-Step Korean Skincare Routine: Winter/Spring 2015) so when their Mother's Day sale rolled around, I was ready to make Jolse mine. Woah, samples. Not only did I get a significant number of regular samples (including a Horse oil cream) Jolse also included a full size sheet mask, a nose pore mask, and most intriguingly, a store-branded sheaf of blotting papers. I see you, Jolse, steppin' out of the crowd with your sample game and cheeky customer interactions; it's working. Cost of Cosrx BHA Blackhead Power Liquid is for 2 bottles at 18.98 each, before discounts. Both the BHA and the A-Sol are repeat purchases; I have been out of both for weeks and my skin is suffering. I have been experimenting with other BHAs but the Cosrx BHA is a staple for me. New, full bottles at left, empty bottles at right. Repeat empties + a month-long dry spell waiting for it to be restocked = acceptance that maybe it's time to look at getting a back up bottle so I do not fall prey to frantic hauls to replace things that are running out. Shopping in a panic leads to bad decision making, so it's better to be calm and prepared. I don't normally advocate buying backups unless it's something you know you have multiple empties of and cannot get easily/quickly. Note that the packaging has changed; the A-Sol now comes in an opaque bottle. Again, replacement of an emptied product. This product is more readily available in my usual shopping haunts, but since I was not going to be combining shipping, it was the most cost effective to get it from Jolse Bae. Like the BHA Power Liquid, I ran out of this weeks ago so I'm glad to finally have it back in my routine. Why I purchased the Cosrx Acne Pimple Master Patch, pictured above: I'm already a huge fan of Hydrocolloid Bandages (review link) for thwarting the nefarious plans of fledgling pimples hellbent on developing into facial supervillains. I have heard good things about the Cosrx versions, although they are a little pricey; I decided these would be my 'unknown/indulgent' purchase as I was curious to see how they measured up to my Korean-version 3M Nexcare acne stickers. I really hope adordee's post generates honest discussion and idea sharing about how one can haul responsibly within one's means while still meeting one's needs; even if that need is to have "skincaretainement" for the sake of your happiness or even your health. As for me, I am content with my budget, approach, and cost:benefit ratio, but everyone needs to find that goldilocks zone for themselves. What are your thoughts about 'Hauling Responsibly'? Do you have an approach that you have developed to meet your needs? I'd love to hear about it, so drop me a comment below or connect with me on Facebook or Twitter! **Disclaimer: All products reviewed/mentioned in this post are 100% purchased with my own money and my opinions are entirely my own. This blog contains both affiliate and non-affiliate links, and clicking the former before you shop means that this blog may receive a small commission to assist in this blog supporting itself. Please see my Contact Info & Disclaimer policy for more information. I'm always seeing everybody's hauls and despite they look awesome, must take a time to see if something of that could fit in my routine, or can be good for my skin. To make a purchase for me (if it's not about limited editions ) it's complicated. Since I must to check prices, weight and my needs. I don't have a spreadsheet (and maybe I need one) but everything I order, it's for replacement of things that are in half way of running out, and to complete the budget a tint or nail polish too. Even my sponsored hauls from Jolse are complicated to make, since I must check for something atractive and useful for readers, but gentle with my skin. Try to avoid HG rant it's hard, specially if the recommendation come from fellow and trusted bloggers, and after checking ingredients I see if I take it or not. But it's more when you have a Blog and readers want you to try some products you consider not worthy (I just can't try again tomatox, or give a chance to nose patches. Or join to the rave for chinese peel off masks, matte liptints or whatever), and I do it for my skin, because it's complicated. What if something goes bad? Aaaand, that's why my purchases take so long lol. And I love Jolse too. Started to buy from them after winning a giveaway and mostly all my purchases were made with them. I love how they are fun and close, and when I've needed some product, they look for it and add it. I think there are multiple variables that contribute to making a purchase. This is not an all-inclusive list, but I’ll touch on the biggies. Price: There are some great products I don’t buy because of their price point, even if multiple reviewers rave about them. Part of the draw to AB is that there are so many great products that don’t cost a small fortune. I will check out several vendors and note prices and shipping. Also, I recently joined forces with my friend for a haul so we would hit the sweet spot for free shipping. I expect the holidays will also result in some major hauls due to sales. Some things can wait, some can’t. Reputation: I have several go-to blogs and I also scan the Reddit boards. If the same products keep receiving glowing reviews or appear in pictures of people’s current routine line ups, I will look into it more and put it on my list. When the need opens up (see Gap), I strike. Brand Loyalty: If there is a brand I like, but haven’t read a lot of reviews about certain products, it just might end up in my shopping cart anyway, but this goes back to the almighty dollar. I just ordered masks from Innisfree because I like the brand and they had a deal on them. Although I have never tried those particular masks before and there aren’t a ton of reviews on them, I acquired them anyway due to trusting the brand and the benefit of the sale. Gap: If there is a gap in my routine, I determine is it really necessary? I don’t have a sleeping pack, but it is nice outside, so I don’t need one until fall. I have several essences I would like to buy, but no gap, so I’m waiting until I’m about finished with ones I currently possess first. Initially, AB was so expensive because I felt that I had to overhaul everything with what I thought was “the best”, and did not slowly incorporate products (don’t do that). Admittedly, I was not an educated consumer at the time either. This lifestyle/addiction is becoming cheaper because I know I don’t have to buy the super expensive products to achieve great results, I take time to read the reviews, compare prices, and the simple fact that everything does not run out all at once (if it did, oh the horror!). Samples: Nothing beats actually trying a product first. Some vendors are very generous of samples (I’m waiting on my COSRX order from BAE because of both of their reputations), and some not so much. I’m lucky that I have a close (proximity and relationship-wise) friend who is willing to share and swap. I can understand why some people by samples of the more expensive products, since many cases it is cheaper than buying a full sized bottle. I’m still on the fence about that. Thanks for all you do. What you write does make a difference; you present some diverse concepts in a safe, knowledgeable, and funny way that opens up possibilities for something new. It helps with spending money wisely on products that have been appropriately vetted. I think we all have multiple reasons why we do this; all of them valid, but addressing fiscal responsibility is just as important and relevant to the AB community as any sheet mask review (even Hanbang, which by the way, those were awesome!). PS Chica Cherry Cola 4EVA! This article is most excellent - well-written and thought-provoking. For me AB is both a necessity and a hobby. AB is the "flavor" of SC that I'm liking most right now and one cannot argue with the results I have achieved. As a hobby, AB goes well beyond just functionality and results. There are things that I want to try/use simply because I want to do so. They seem like they would be fun or interesting or add something to my routine - or they are some kind of special limited edition item that I would like to collect for that reason. No matter what anyone else says - including people like you for whom I have the very highest regard and admiration - the proof of the pudding is always in the using and you have to have it - one way or another - to use it. The same applies to my other hobbies. My wife would tell you that my basement workshop has "every tool known to man, and then some". I don't use everything in my shop all the time, but when I need something, I like having it handy. There are also other items that I have because they were "limited editions" of one sort or another and I wanted to add them to my collection. For the most part, these are things that I rarely use because I bought them as collector's items and, as such, they do mean something to me. Some of them were, of course, gifts. While the analogy to AB and SC is not exact, I think you get the point. Certainly, no one should go bankrupt purchasing SC products. OTOH, when viewed as a hobby, the reigns become a little looser, providing, of course, that you can afford it. I will never stop being excited at how this has blown up! That everyone is embracing this and that healthy discussions are happening all around about how we view our purchases is absolutely overwhelming to me. A lot of the times this topic is conflated with being frugal, which then leads the discussion to centre around 'getting the best savings' and 'hitting the right sales'. At times (at least in my case) this just fuels the fire of over-consumption because you tell yourself you're getting such a 'great deal'. Frugality is a part of it, but it's more about finding the right balance for yourself. The emotional high of spending money is real, but if after the money has left your account, you're left feeling more anxious and have pile of purchases untouched then that's a real issue that needs to be addressed. I remember some people were talking about how they were always embarrassed to talk about their higher priced products because they were worried about being judged for spending too much. That conversation constantly coming up, combined with your posts (and other discussions) about putting together your high value hauls helped me realise that, YMMV is not just about the effectiveness of the products but also about our approach to them. While you and I see skincare as a hobby and enjoy spending time being part of the community, some people really just see skincare as just a thing you do to look good and don't pay much attention to it. Neither way is wrong, that's just what works best for each person. What's important is that you have a system of buying things that suits what you need. Not buying because that's what your favourite blogger is using, not buying the big hype ingredient or product just because, but spending your money responsibly on what works for you. That goes for if you need to be frugal and can only afford the slowest shipping, or if you can afford to buy £100 worth of items every week and use EMS for everything. It's just about sticking to what is responsible for you. I love reading your posts where you outline your thought processes with each purchase. I find them so fascinating and useful. While I may not go the way of the spreadsheet just yet, I'm always amazed and interested at your skills in creating them! Great post! I felt the same way about Jolse when I saw them reference the "bae" post. They instantly went from this abstract non-human company to a group of real, fun, people. I just placed my first order a few days ago. I like to fake haul... or put a bunch of items into my cart and not actually buy anything. I get to window shop without dropping a lot of money. I've decided to just stick to buying one product at a time for the next few months while I'm still getting used to skincare routines. I like your word : behind every Haul is hours upon hours of research, discussion, organization, planning, and deliberate decision making. for me, it takes weeks even months, from blog to website, forum, any source I could get. It's been long since I have a real haul, usually it's repurchase of things I love and trust. However, I am waiting for your cosrx reviews, I think I might need a change for next few months.